Angelo da Orvieto seems to have been trained by Lorenzo Maitani, who had been appointed as the capomaestro of the Duomo of Orvieto in 1310. He might have been the “Angelo” documented with Maitani in Perugia in 1317. His first securely attributed work was probably as the architect of Palazzo dei Consoli, Città di Castello: an early transcription of the now-illegible date gives it as 1322. 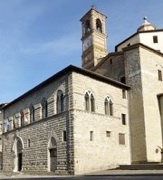 Two other inscriptions record that he was associated with the portal of Palazzo dei Consoli in Gubbio (below) in 1332-7. No works in his native Orvieto are attributed to him. An inscription on the architrave of the main entrance of Palazzo dei Priori was apparently inscribed with the names of the architect, Angelo da Orvieto (“URBE DE VETERI ANGELUS ARCHITECTOR”), of the foremen, Baldo di Marco and Meo di Gano and the date, 1322. However, work was presumably halted during Pier Saccone Tarlati’s occupation of the city in 1323-35. It presumably resumed after the statute of 1336 that inaugurated the government of Città di Castello by eight Priors drawn from the city guilds. ✴The relief in the lunette of the main entrance depicts the arms of Città di Castello. ✴The relief in the lunette of the other (now closed) portal depicts a personification of Justice. with an inscription below urging the people to embrace peace, so that the city can be ruled justly. ✴The upper floor contains a fine series of bifore windows. An earthquake in 1354 undermined the project, and a planned upper floor was never built. The main portal leads to a vaulted area on the ground floor. The capitals of its polygonal columns are finely carved. The stairs (16th century) to the right lead to what was originally the Sala del Consiglio (council chamber). The Baroque façade (1687) of Palazzo del Podestà in Piazza Matteotti masks a Gothic palace that is attributed to Angelo da Orvieto. (If this attribution is correct, it is his last known work). Unusually, there is no entrance in the façade. The double clock (date?) is unusual: the clock on the left records the hour, and that on the right the minutes. The original character of the palace is much clearer from its right hand wall in Corso Cavour, which has a row of lovely bifore windows on the piano nobile. The nine vaults on the ground floor here were rented out as shops. The arms in the lunettes include those of Paolo and Baglione dei Baglioni, who served as podestà in 1336. A relief of the arms of Città di Castello in the lunette with an inscription underneath distinguishes the 4th arch along the Corso. This arch, which is larger than the others, forms the entrance to a barrel vault under the palace that communicates with the open portico (17th century) along the opposite wall: the entrance to the palace is under this vault, on the right. 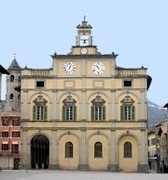 The design of Palazzo dei Consoli is sometimes attributed to Matteo di Giovannello, il Gattapone. However, modern scholars suggest that this is an example of “campanilismo” (local pride). In fact, an otherwise unknown Baldello di Nello was documented in 1333 as “officialis supra”, assisted by “Angelo di Lucolo”. This is probably Angelo da Orvieto, who was documented again with Baldello di Nello in 1337 and soon emerged in documents as the team leader. ✴the inscription around the lunette adds that it was put in place in 1337, and that Angelo da Orvieto was responsible for the work. The exiled artist Guido Palmeruccio was allowed to return to Gubbio in 1342 on condition that he executed a number of frescoes in the palace. While most of these frescoes (including an Annunciation and an Assumption of the Virgin) have been lost, others that survive might belong to this programme. The city magistrates moved into the Palazzo in 1349, and the campanile was finished in 1389. The ground floor is largely taken up by the huge Sala dell’ Arengo, which once housed the assembly of the Commune. The stairs at the back of the room lead to the former sacristy and then the former Cappella Palatina. Further up the stairs, a room on the right that houses the Commune’s ceramics collection leads to a passage that contains the medieval toilets that (unusually for this period) drained into a sewer through clay pipes that were built into the walls during construction. The top floor now comprises the five rooms. The Sala della Fontana, at the top of the stairs, has a fountain at its centre and a sink with four taps in the right wall, both of which were served by the medieval aqueduct. This sophisticated plumbing system was installed in 1350. A door to the right at the top of the stairs leads to the loggia, which offers a splendid view of the valley below. M. Belardi, “Il Palazzo dei Consoli a Gubbio e il Centro Urbano Trecentesco”, (2001) Perugia, (in particular, Chapter VI). The palaces at Città di Castello are covered at pp. 81-4. Return to the page on Art in: Città di Castello Gubbio.